Back cover blurb: In 2003, sixteen-year-old Rebecca Winter disappeared. She’d been enjoying her teenage summer break: working at a fast food restaurant, crushing on an older boy and shoplifting with her best friend. Mysteriously ominous things began to happen—blood in the bed, periods of blackouts, a feeling of being watched—though Bec remained oblivious of what was to come. Eleven years later she is replaced. A young woman, desperate after being arrested, claims to be the decade-missing Bec. Soon the imposter is living Bec’s life. Sleeping in her bed. Hugging her mother and father. Learning her best friends' names. Playing with her twin brothers. But Bec’s welcoming family and enthusiastic friends are not quite as they seem. As the imposter dodges the detective investigating her case, she begins to delve into the life of the real Bec Winter—and soon realizes that whoever took Bec is still at large, and that she is in imminent danger. 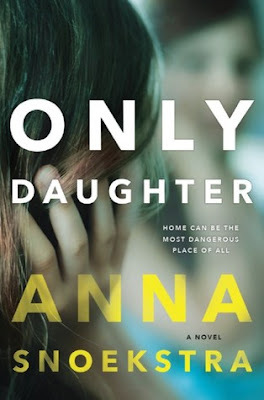 Only Daughter is a very fine debut novel. It propels you headfirst into its plot, grips you tightly and doesn't let go until it's very end. Rebecca Winter has been missing for eleven years. She vanished seemingly without a trace on her summer break. Her life was largely carefree, she was working in a fast food restaurant, crushing on an older man and despairing of her family. Eleven years later and a young woman on the verge of arrest for shoplifting, declares herself to be Rebecca Winter. She returns to the Winter family and the local detective wastes no time in re-opening the investigation into Rebecca's disappearance. There is something undeniably creepy about the Winter family, that is difficult to put your finger on. But this only adds to the overall tension of the novel. Without saying too much more, Only Daughter is a novel that will keep you gripped, and turning its pages frantically to discover what's coming next. Only Daughter is available from 22 September 2016.